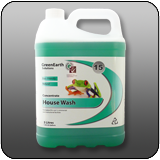 An ecologically sound, environmentally conscious,natural house wash cleaner, formulated to quickly penetrate, emulsify and remove light to medium soils. Our natural house wash cleaner cuts through grease, grime and dirt as well as traditional cleaners. But because it's made from plants and minerals it leaves no harsh chemical fumes or residue. And since it's 100% natural, it's better for the environment too. Super concentrated so as to be used in high pressure water blasting cleaning machines.